Do you know what is your passion? I myself never know what is my passion. Until today i still haven't know what my passion is. Usually successful people or motivators always encourage one to do something which is one's passion. When you asked some successful people, why they start doing that business, etc etc.. Mostly their answers are like... it's my passion. But like me, who never have any certain hobby until today. No special ability. er.... then how leh? But usually - since i was like junior high school - if i should write my hobby i always write "reading". er... do i like reading ? hahaha.. to think about it, yes i like reading. Years ago, my favourite place is like book store. Everytime i go to book store, i always wanted to buy books. If got money then bought books. If no money then didn't buy lah. haha. At that time, i like to read books such as Chicken Soup, etc. But still, i read using internet.. But what i read is not like news or very full of knowledge one lah (i don't know much about general knowledge T_T). I like to read like more social or daily stuff one. For eg. if there is an article about war at a place and the other article is about someone's experience at subway, i will go read about someone's experience at subway rather than about war. Wew... Some people might think i am stupid or ignorant lah i guess.. haha. Because of that, i hardly consider that i like to read since what i read is like not that important (in most people's mind - most people will think war is more important, right?). So yeah i don't know what is my hobby and i didn't know what should i write for my presentation. Then i was like reading blogs .. Then i saw a post (draft) by my boyfriend, he wrote that i like blogging. Then i was like... er... yeah i do like blogging! I like to read blogs. Everyday i read blogs. I also like to write blog actually. Before at my old blog i write quite often about my not that interesting life. But then i was like not writing much anymore. Even though now i write at this new blog, i also don't write much. I only upload pics and a few words only. Actually, i'd like to say out like a lot... but i really don't like if family know my personal stuff or personal feeling. Yeah, i only share general stuff or feeling to family coz we never share personal feeling so i am not used to. 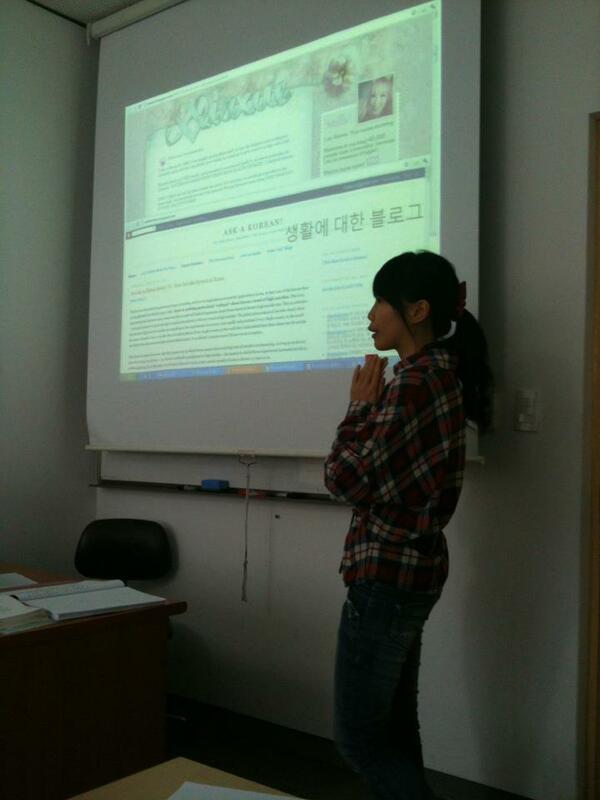 Then i wrote about i like blogging for my presentation.. And then when i did the presentation, i felt excited! I was like so happy talking about blog. 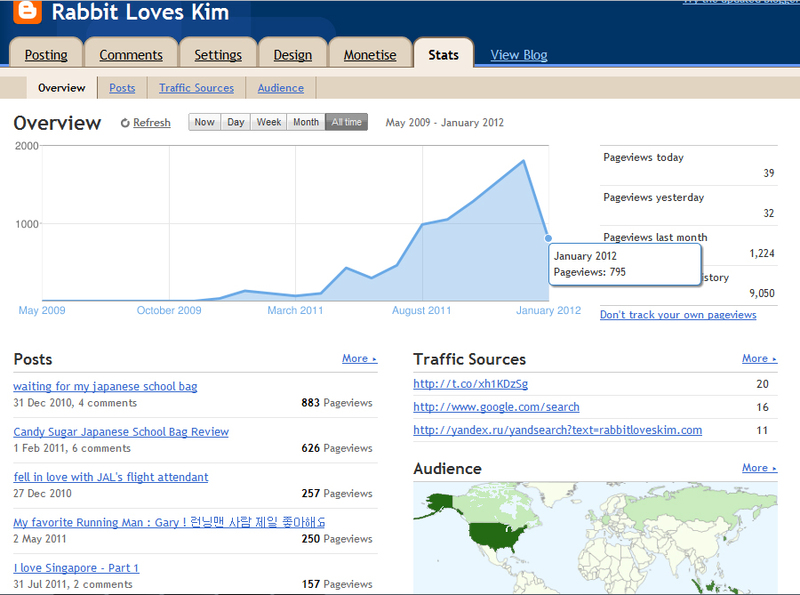 And yeah, i like to read XiaXue's blog and Ask A Korean ! Then i realized... why all of this time i kept updating my blog with so not interesting stuff ?!?! omg, i myself don't like to read my blog actually. I prefer to read my old blog where i write more rather than this one which is like only pics. No opinion or my thinking at all, so boring. Though seems like i don't have readers.. I only have readers who i think got my blog when searching something at google such as when people want to find a japanese school bag. This is really my most viewed post! lol! So, even though no readers (family doesn't count), i don't care lah. Basically i write for my own memory. If i have readers one day, then it's like bonus lah! :D I hope readers (later) enjoy to read my blog like how i enjoy to read my favourite blogs. I like to read blogs because reading more, knowing more about people's opinion or thinking can somehow make your heart wide like sea. (i don't know if this is a proverb or not, i just learned it at my Korean class :P 바다처럼 넓게 생각해요). And also can learn from other people's experiences. I want to write more! Since actually i have many opinions or thinking in my mind. Good opinion or bad opinion, i don't care. Let's say it's bad - later when i am older and read my old blog posts, i can see that how much my thinking has changed. Like now, when i read my old blog, i can see what kind of me before and how the present me was build. Hopefully i can know what is my passion yeah!